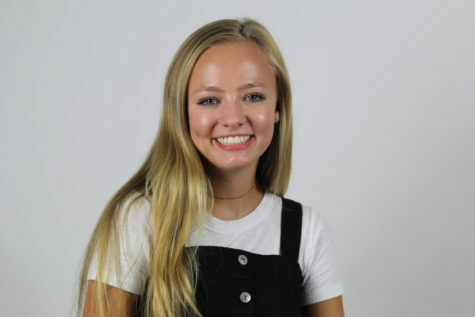 As her third year working on The Red Ledger staff, junior Lulu Butler serves as the class’ News and Opinion editor and is eager to start another exciting year full of writing. Butler is also known by many to laugh at any and everything and make everyone else laugh along with her. She’s also commonly caught repeating the phrase “I can’t, I have dance” as she trains 20+ hours every week as a ballet dancer. Her other interests include hanging with friends, taking long drives, music, taking pictures, reading, yoga, and going to church. Lulu is also involved in National Honors Society, French Club, and Student Council where she serves as Treasurer. Butler also finds joy in spending time with family, writing, and adding to her ever-growing polaroid wall (she’s a sucker for nostalgic pictures). Because she won’t be growing in height anytime soon, she hopes to grow immensely as a writer and editor on this year’s staff. Above all else, Lulu loves to stick in the fact that she was the Sophomore Homecoming Duchess wherever she can.